Depending on the Skin in use the Web Theme allows a custom image to be uploaded to the header bar. In your browser address bar enter the URL of the DriveWorks Live implementation. Log onto the implementation using your credentials (must have administrator privileges). Type setup/ at the end of the URL. Click the skin settings link at the top of the setup page. Depending on the skin currently in use this link may not be available (see table above). 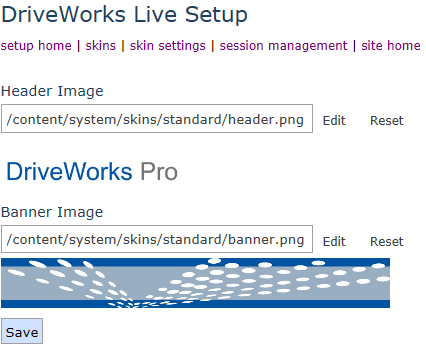 The skin settings page displays the path and name of the current image in use along with a preview below. Change the image by clicking the Edit link to the right of the path and browsing to the new image. The original images used by the skin can be restored by following steps 1 to 4 above. Click the Reset link to the right of the current image path.